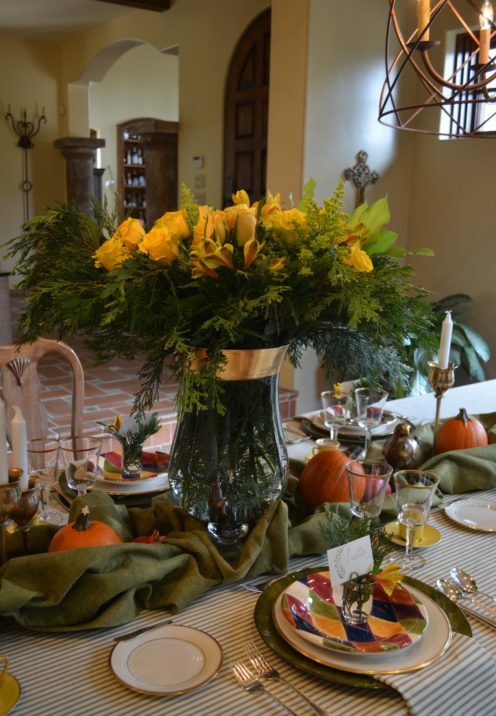 I love to set a beautiful table and take a lot of pleasure in doing so. I find this creative endeavor to be quite fulfilling, but it’s a very time consuming activity, often taking me hours. 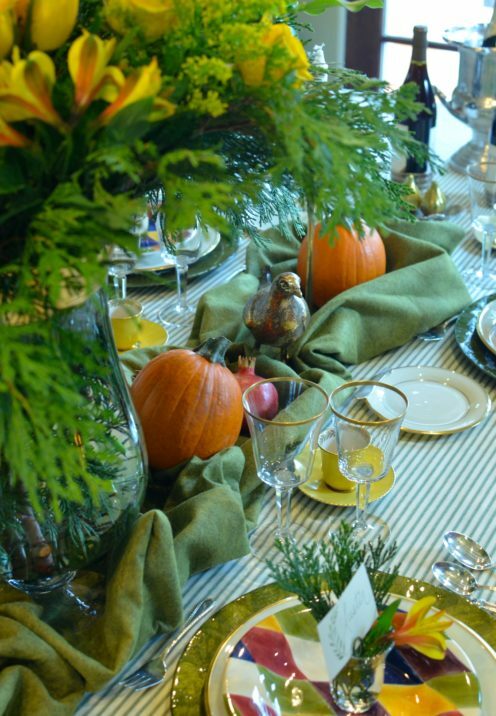 Therefore, I set my table as far ahead of time as possible so that on the day of my event I can concentrate on the food and other party prep without having to worry about my tablescape. 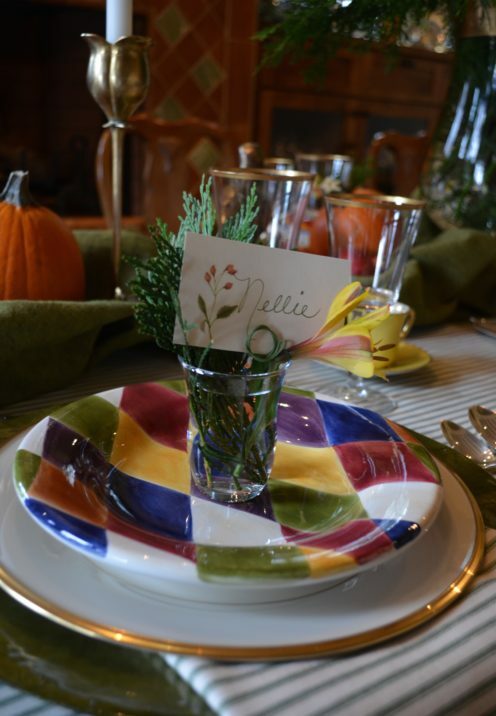 With Thanksgiving just around the corner it’s not too early to start planning your Thanksgiving tablescape and, toward that end, I thought I’d give you some of my tips on how to set a lovely Thanksgiving table. Let’s start with the place cards. Unless I’m having a very small dinner party, I generally like to determine where my guests will be seated. 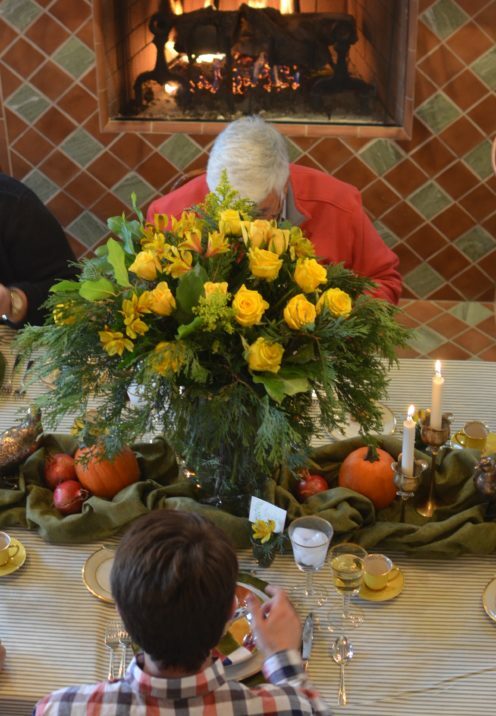 I give a lot of thought to the seating arrangement and try to place people where they will not only be comfortable but are also likely to engage the most with fellow guests. Lively conversation and interaction is the basis for a great party. 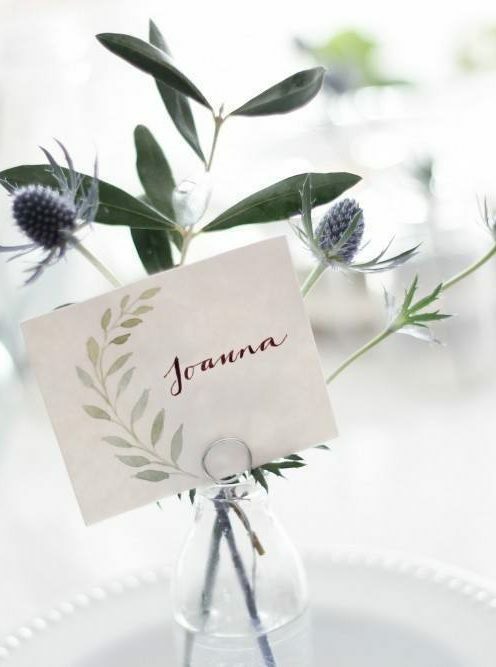 I’m often on the lookout for pretty place cards and happened to find the artwork for some very sweet ones on JoAnna Gaines’ Magnolia blog. 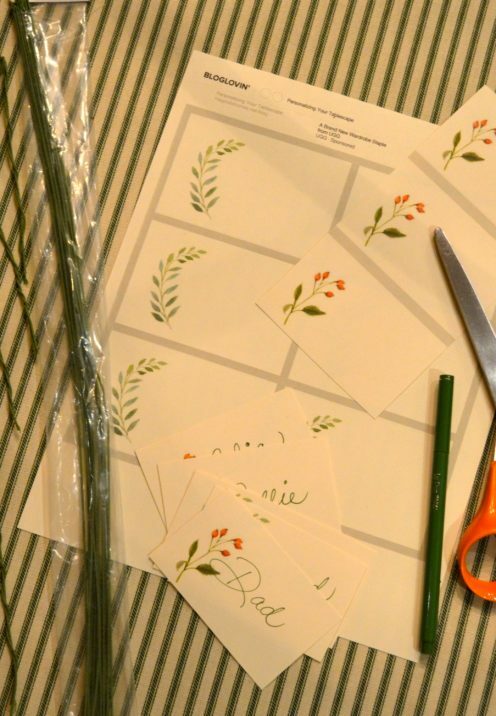 You can download the free printables and produce your own lovely place cards by clicking here. And that’s exactly what I did. I printed the watercolor place card art onto heavy cardstock and cut them out. I also followed Joanna’s lead by making my own wire place card holders. 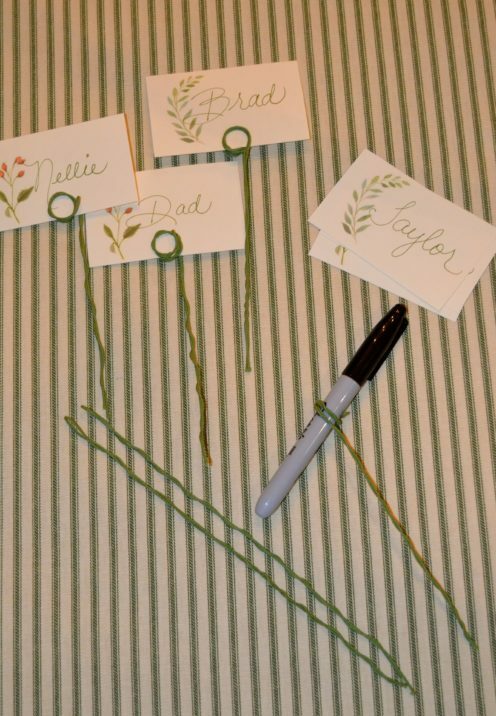 I used green floral wire and simply twisted one end a couple of times around a Sharpie pen and then inserted the place cards between the loops. I placed a single floral stem with some greenery cut from my garden in small Turkish Tea Glasses that became tiny floral arrangements at each place setting. 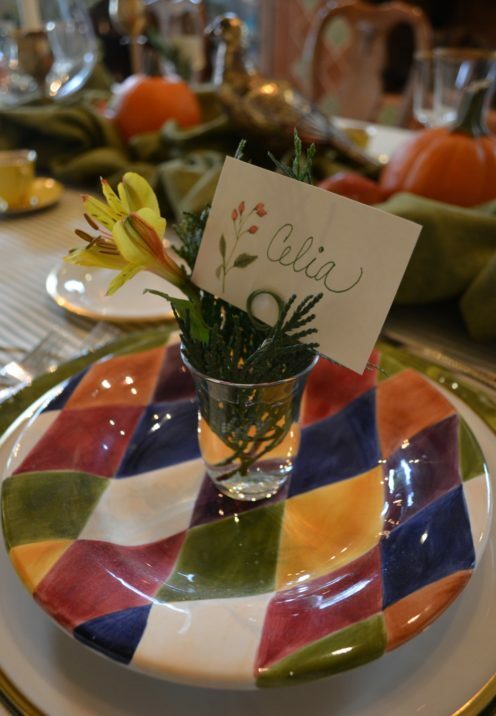 I then slipped the wired place card into the greenery and voila, I had a simple yet lovely way to display my place cards. 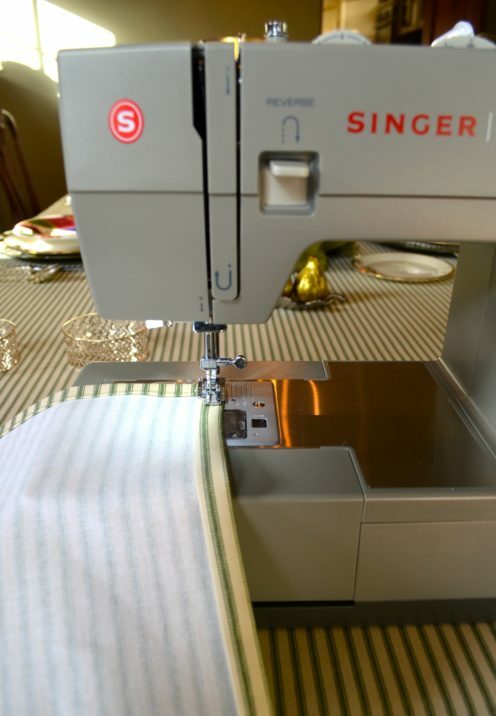 If you’ve been following me for awhile you already know that I like to sew my own tablecloths and napkins. It’s so simple and so inexpensive to do, and I really encourage you to give it a try. One of these days I’ll have to post a napkin making tutorial. For my tablescape I scrunched a long, narrow piece of fabric down the middle of the table, extending about 2/3rd of the length of the table. 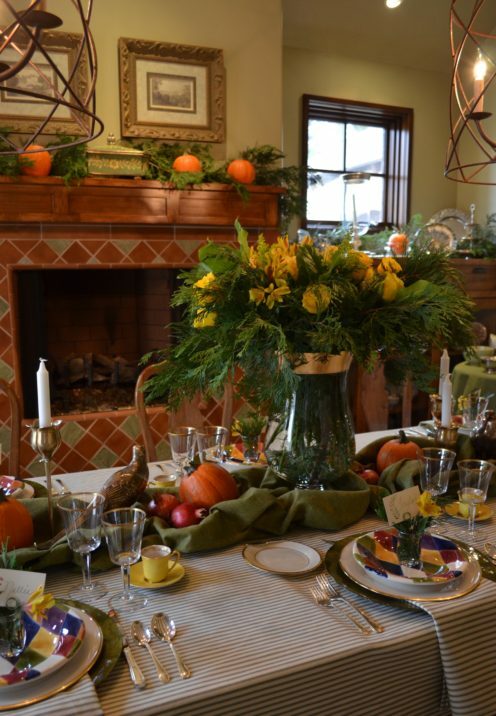 I added small pumpkins, pomegranates picked from my own tree, and some bird figurines and candlesticks. I like to mix and match my china. 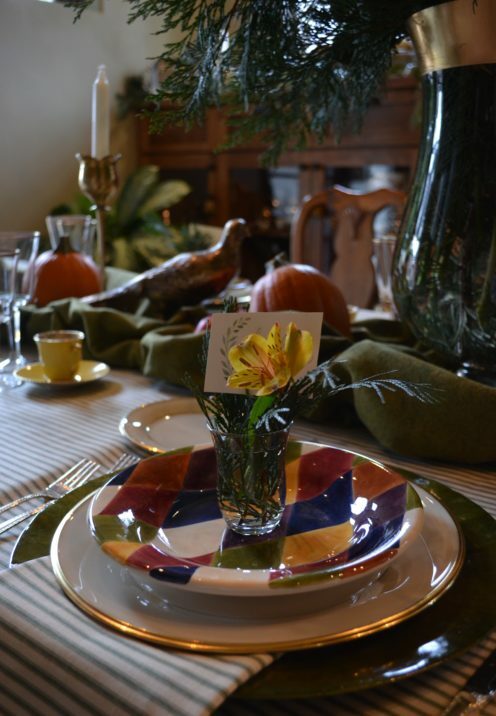 For this tablesetting I mixed my gold trimmed Lenox Eternal China, stemware and silverware with colorful ceramic salad plates and yellow antique espresso cups & saucers for an eclectic look. 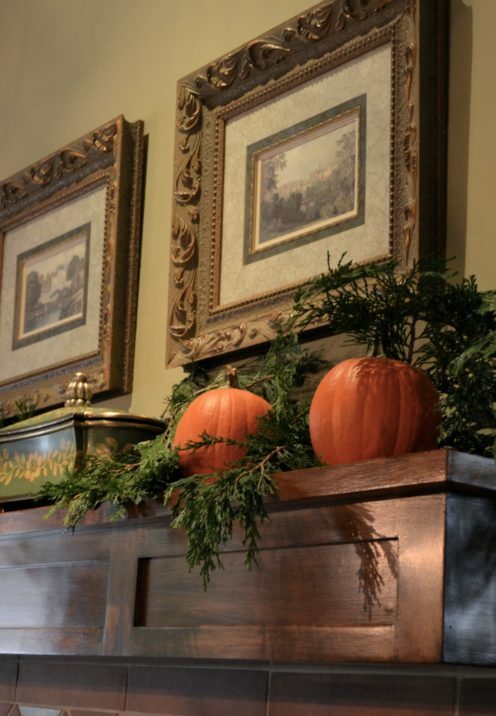 I decorated the fireplace mantel with more cedar greenery and pumpkins. 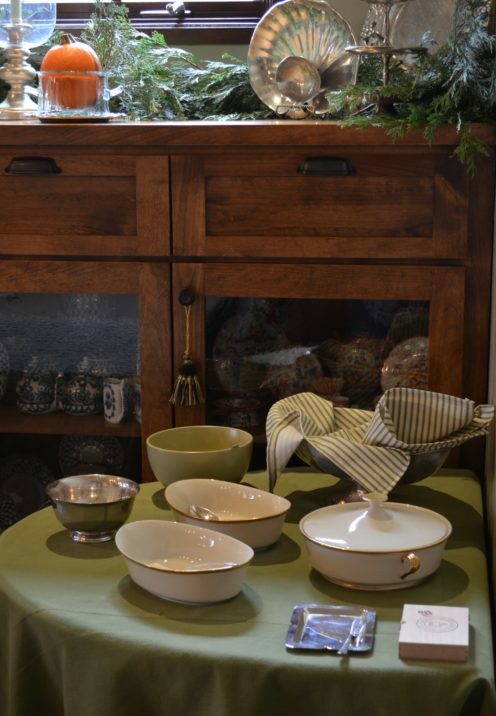 Something else you should always consider in advance is the serving pieces you will need. I write down each menu item on a small note card and place it inside the serving dish I determine I’ll use for each menu item. That way there’s no scrambling at the last minute for serving pieces. 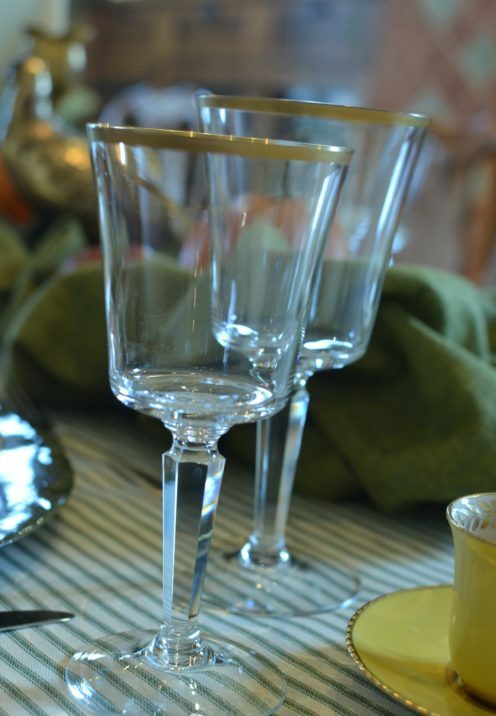 And don’t forget the beverage service. 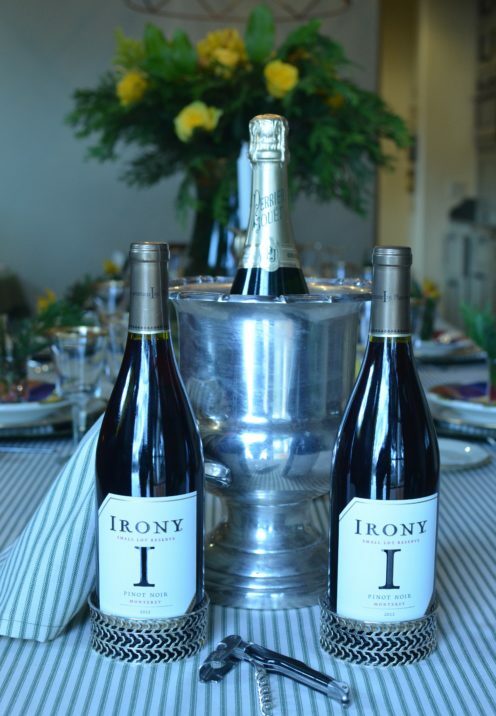 Pick out the wine you’ll be serving in advance. I use silver wine trivets for the red wine and a silver ice bucket for the white wine & champagne. Make sure to have a corkscrew at the ready as well. 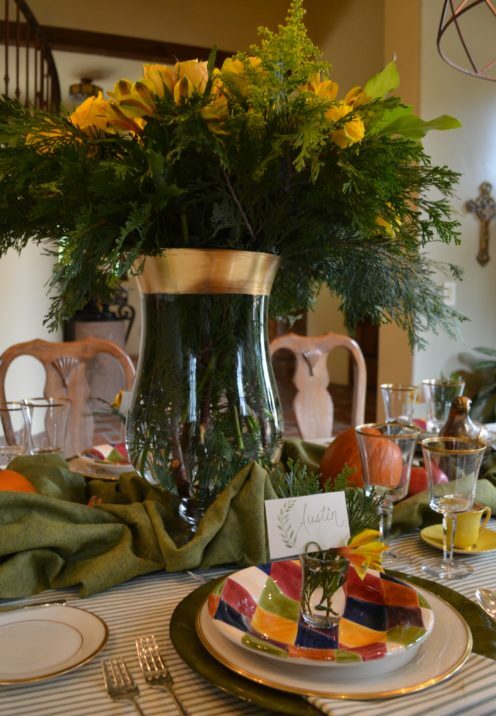 I also chill carafes of ice water that get placed on the table just before guests are seated. 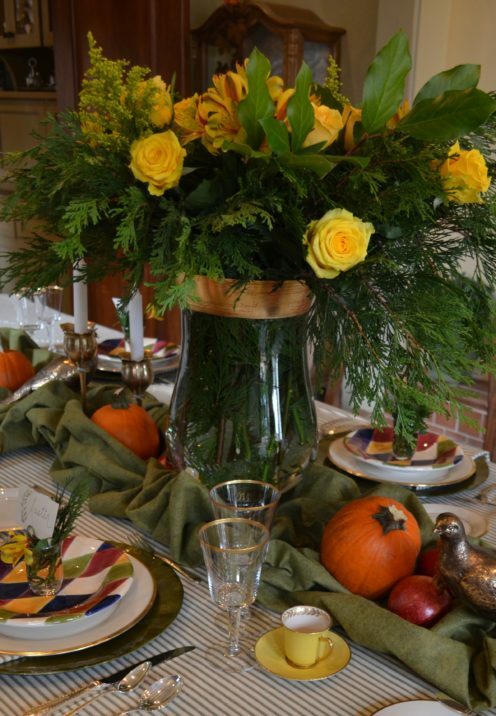 I hope I’ve given you some ideas and helpful hints to make your Thanksgiving go a little bit smoother. All opinions expressed in this post are my own. All photos are the original property of Celia Becker @ www.AfterOrangeCounty.com and may not be reproduced without specific permission. This post contains affiliate links which help to make this blog possible.